Our offer includes other Infor systems, which complement the ERP part. These are systems which support – on a very detailed level – areas such as product life cycle, supply chain, or e-business. What is difficult to provide for within the ERP standard, can be supported by these systems, which are flexible and can integrate easily not only with Infor M3 but also other ERP software. Thanks to our experience we share our knowledge and suggest solutions which have been positively verified in practice by our customers. Reduce time to market by 50% or more. Reduce materials usage by 20% to 50%. Increase on-time launches to 98%. Infor Supply Chain Management combines best in class solutions with industry-specific functionality, giving you the power to plan and execute your supply chain strategies faster and more profitably, from strategic and tactical planning to execution. With analytics at the core, you’ll get the tools you need to optimize your end-to-end supply chain and harness the power of social networking to collaborate more effectively internally, as well as with customers, partners, and suppliers. Gain greater visibility into your supply chain to optimize utilization of resources and labor, improve inventory and shipping accuracy, deliver the perfect order every time, and respond faster to customer opportunities and market fluctuations. 17% higher perfect order scores. If your business is like most, the organizational systems you use have evolved over time, creating a complicated technology landscape. Disconnected systems and information silos result in inefficiencies, costly maintenance requirements, and ultimately—missed opportunities. Easily integrate both Infor and third-party software applications with Infor’s innovative Intelligent Open Network (ION). This purpose-built middleware solution provides a simple but powerful and scalable framework, allowing you to eliminate operational silos, dramatically improve exception management, and achieve unparalleled end-to-end efficiency. 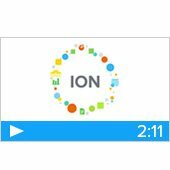 ION enables disparate business systems to share information by translating it into the common language of standardized XML. 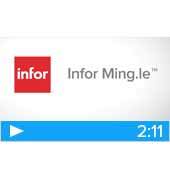 Infor Ming.le™ is a centralized platform for social collaboration, business process improvement, and contextual analytics. The solution accesses key operational and administrative applications in real time, giving you collaboration technologies that are fully integrated across business processes, not just added on. When employees are able to follow critical data, events, and people, every touch point across your enterprise becomes organized and actionable. Integrated tracking allows users to filter key enterprise data and events between disconnected forms of in-office communication–eliminating obstacles to effective, timely communication that decrease efficiency and productivity. Do you have any questions about the ERP ecosystem?